I know what you're thinking, "those two foods don't go together..." but they do! If it wasn't for the occasional green bits of zucchini sticking out, chances are you'd never know it was in there. However, the zucchini does something wonderful to these muffins I can't quite put my finger on... they rise beautifully and have a slightly spongey feel to them... ahh I know what it is! 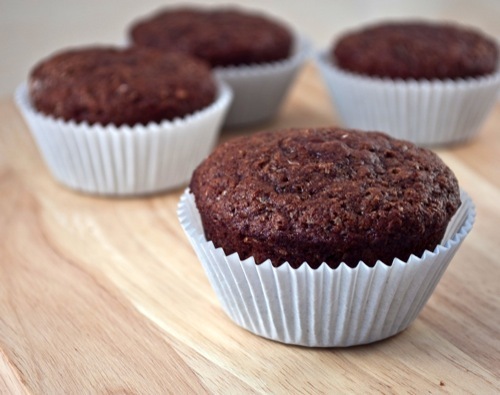 It's that hidden zucchini that makes me feel good about eating these muffins! They're practically fat-free and whole wheat too! Eat 'em up!